Always buy a stock on first day of swing move. Or before swing move. If you are swing trader do what works in swing trading. 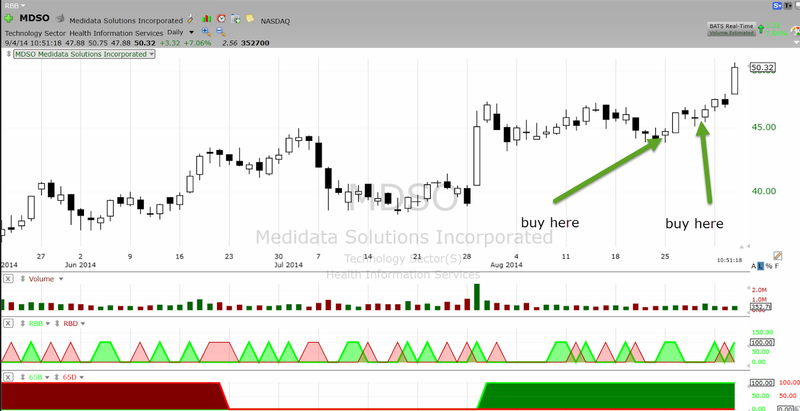 If you buy MDSO today ask yourself what were you doing at right low risk entry points. May be you were busy loading your nudes to Apple cloud. Swing trader buy stocks after a period of weakness as it starts new swing . Some buy in anticipation. But key is to buy as early as possible in a swing move. 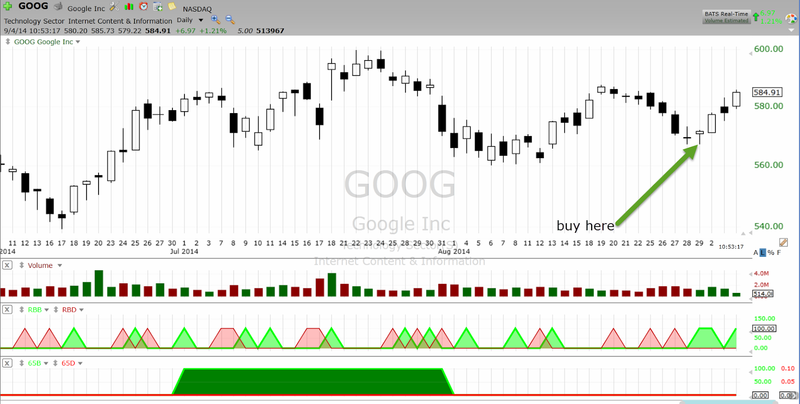 Where was the low risk entry in GOOG. If you buy it today and call yourself swing trader, may be your definition of swing needs re examination. Buy near swing start and sell near swing end. That is the essence of swing trading. And do it hundreds of times in a year. But if you buy at wrong place , it is unlikely you will survive to make those many trades. If you are buying a stock on 3rd or 5th day of swing you are starting with low probability entry.Those who have trouble deciding which day of swing is this , should practice and identify at least 500 swing start days before attempting to trade momentum bursts. In a universe of 10,000 things to buy question becomes do we have patience and discipline to wait and take only the best setups. There is no shortage of setups so why enter on the 3rd or 5th day of the move?" That is such a basic skill to develop but time and again beginners or some veterans also can not overcome the temptation to buy later in swing. Buy a swing trade preceded by some weakness in last 4 to 5 days or flat action. If a stock is already up ask yourself , what were you doing on first day of start of move ? If you want to make money trading do the right thing. Do you buy at a certain time of day? If so, do you use an intraday chart to time your entry? I buy as and when my stock meets my scan condition. I do not use intraday charts for that. Thanks for the reply. I've found sometimes earlier in the day a stock will show up on my screener, then by the end of the day it might not show on the screener any more. I really like your site, since it is full of useful information which can be easily understood and followed. In your image about GOOG above however I seem not to fully understand, why you are pointing out an entry point at the given location. 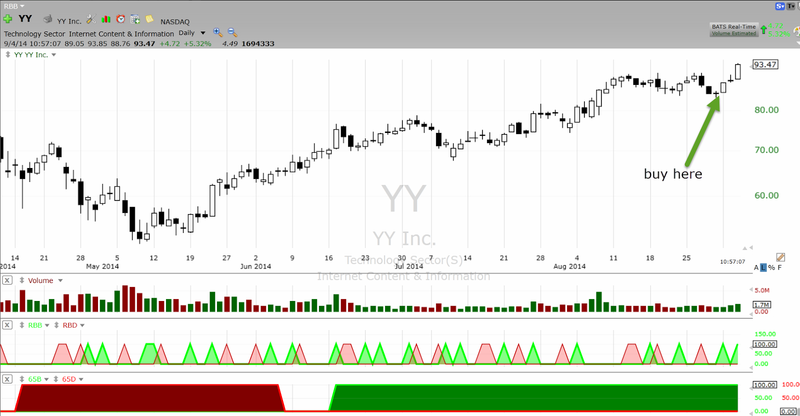 Accordinig to your Setup logic , you say there should not be too many Breakdown days before and in this case, GOOG suffered from many of the breakdowns upfront to your dedicated buy point. Could you explain , why this is still a possible entry point in your opinion! Those are not 4% breakdowns. That chart template is $ b/o template. Like Drew said, sometimes that 4% breakout will fade away throughout the day or maybe pullback and then go back up. Do you just buy as soon as it reaches 4% if it meets your criteria? Do you scale in trades or wait to see if the stock will have a strong close on the breakout day?